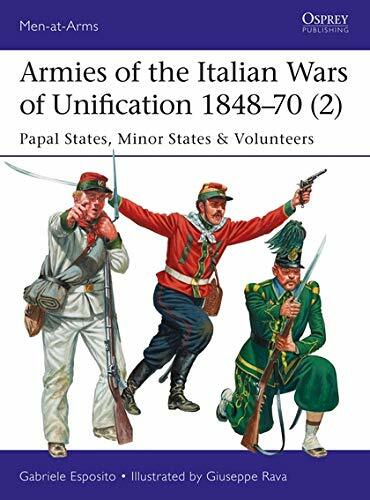 Armies of the Italian Wars of Unification 1848–70 (2): Papal States, Minor States & Volunteers (Men-at-Arms) est le grand livre que vous voulez. Ce beau livre est créé par Gabriele Esposito. En fait, le livre a 48 pages. The Armies of the Italian Wars of Unification 1848–70 (2): Papal States, Minor States & Volunteers (Men-at-Arms) est libéré par la fabrication de Osprey Publishing. Vous pouvez consulter en ligne avec Armies of the Italian Wars of Unification 1848–70 (2): Papal States, Minor States & Volunteers (Men-at-Arms) étape facile. Toutefois, si vous désirez garder pour ordinateur portable, vous pouvez Armies of the Italian Wars of Unification 1848–70 (2): Papal States, Minor States & Volunteers (Men-at-Arms) sauver maintenant. In the 1840s, Italy was a patchwork of states. The North was ruled by the Austrian Empire, the South by the Spanish-descended monarchy of the Two Sicilies. Over the next two decades, after wars led by Savoy/Piedmont and volunteers such as Garibaldi, an independent Kingdom of Italy emerged. These conflicts saw foreign interventions and shifting alliances among minor states, and attracted a variety of local and foreign volunteers. This second volume in a two part series covers the armies of the Papal States; the duchies of Tuscany, Parma, and Modena; the republics of Rome and San Marco (Venice) and the transitional Kingdom of Sicily; and the various volunteer movements. These varied armies and militias wore a wide variety of highly colorful uniforms which are brought to life in stunning, specially commissioned, full color artwork from Giuseppe Rava.